I did not want it to end…I wanted it to last and last for an Eternity. 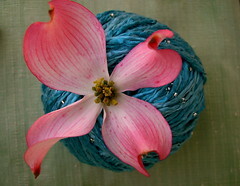 The silk yarn shifted smoothly from my bamboo needle, caressing my fingers. The nubbly feeling of each tiny little glass bead made me sigh of of delight. 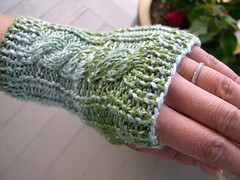 This fingerless glove with just one cable running through it, is one of the first patterns I wrote myself. 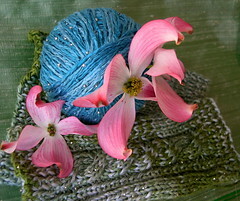 At first I was afraid that the variegation of the yarn would obscure the fine cable, but luckily, it did not. I could not wait any longer to work with the blue beaded silk as well, wound it up in a centerpull ball by hand, and casted on quickly to make another fingerless glove, this one however, with a plaited cable. These fingerless glove patterns are both written to knit flat. This means that I did not use double pointed needles, but knitted flat instead. 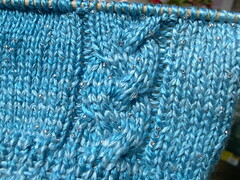 After the knitting is done, I seam the glove. 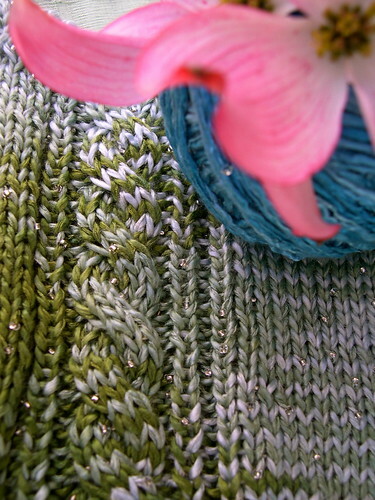 At the time I wrote this pattern, I could not knit with dpns yet. This entry was posted on Sunday, April 29th, 2007 at 11:15 pm and is filed under fingerless gloves, Knitted cables, Knitting, WIP, Yarn. You can follow any responses to this entry through the RSS 2.0 feed. Both comments and pings are currently closed. Oh, how luxurious. I especially like the blue one. Wat sjiek zeg. Serina vindt ze ook mooi. Dus ik moet aan de gang. Maar eerst het behang erop bij Romy kamer en dan kan ik mij hobby weer oppakken. Ik heb gezien dat je ze ook in andere mooie kleuren heb, die beaded silk yarn. Succes verder.